Visibility continues to be a major problem during repair of obstructed total anomalous pulmonary venous connection (TAPVC) resulting in frequent use of deep hypothermia and low flow bypass. Sutureless technique for primary repair of anomalous pulmonary venous connection is fast becoming popular. In this described modification of sutureless technique through the lateral approach, the left atrium is marsupialized around the common pulmonary venous chamber, except on the right lateral aspect, providing a bloodless field with minimal retraction of heart facilitating the surgery at mild hypothermia. This technique can be particularly useful in small confluence obstructed TAPVC and in mixed TAPVC. Conventional technique for repair of total anomalous pulmonary venous connection (TAPVC) involves suturing of the left atrium to pulmonary venous chamber directly (1). Various techniques for conventional repair (superior approach, posterior approach, lateral approach) have been described depending on the type of TAPVC. Sutureless repair also called atrio-pericardial technique was introduced initially for pulmonary venous stenosis post TAPVC repair. Sutureless repair is fast becoming a popular choice for primary repair in TAPVC. Sutureless repair involves suturing of the left atrium to the posterior pericardium around the common pulmonary venous chamber. A common problem during repair of TAPVC is adequate visibility due to increased pulmonary venous return. Increased pulmonary venous return forces the surgeon to cool the patient to a level more than what is ideally required. Using a vent at high revolutions per minute can lead to hemolysis and coagulopathy. We describe a technique of modified closed chamber sutureless technique through the lateral approach without opening the common pulmonary venous chamber initially. This technique simplifies the procedure by providing excellent visibility and also involves minimal retraction of the heart and handling of the pulmonary veins. Cardiopulmonary bypass is established with aorto-bicaval cannulation. Vent is placed in pulmonary artery. Cooled to 30°. Superior vena cava (SVC) and inferior vena cava are dissected. The heart is totally freed except for the caval attachments by minimal dissection of the posterior pericardial reflection. Cold cardioplegic arrest of the heart is attained. The right atrium is opened by a limited incision to inspect the interatrial septum. 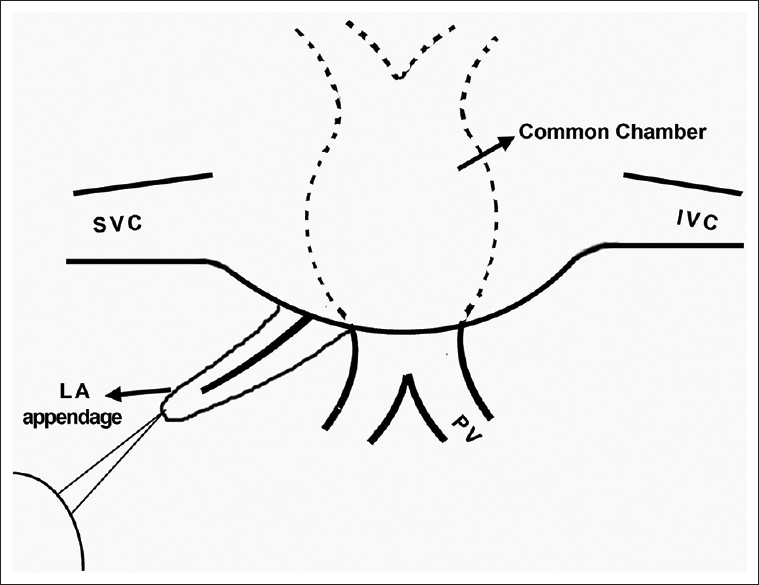 The left atrial appendage is brought to the right side posterior to SVC and stay suture placed on it [Figure 1]. This step facilitates the opening of the left atrial appendage from the tip to the posterior wall of the left atrium without retracting the heart. Care is taken to prevent coronary and mitral valve injury. The heart is gently retracted to the left with malleable retractor, which gives a good view of the unopened common chamber. The left atrial appendage is pushed back to the left side, and the tip of the opened left atrial appendage is sutured to pericardium over the left upper pulmonary vein [Figure 2]. The opened up left atrium is then sutured in a circular fashion around the unopened common pulmonary venous chamber until the right lateral portion of the common pulmonary chamber is reached [Figure 3]. Thus, almost two-third of anastomosis is done in a bloodless field. The malleable retractor is then placed into the neo-left atrium to visualize the unopened common chamber. 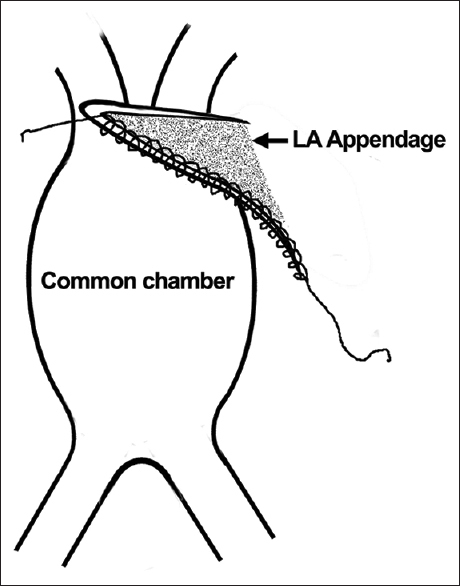 The anterior wall of the common chamber is excised [Figure 4]. The incision can be carried onto individual pulmonary veins. The vent is placed through the small right atrial incision across the atrial septal defect (ASD) or patent foramen ovale (PFO) into the neo-left atrium. Finally, the right lateral eye of the anastomosis is completed taking care not to involve the phrenic nerve in the suture [Figure 5]. The ASD if big is closed with a tanned pericardial patch and a 4 mm fenestration created before closing the right atrium. If the ASD is small, it is made restrictive with an interrupted stitch. The vent is placed through the fenestration or PFO and brought out through the right atrial appendage. A pulmonary arterial line is placed in all obstructed patients for monitoring in Intensive Care Unit vertical vein is ligated after coming of bypass, except in infracardiac TAPVC. We have used this technique in five neonates (3 obstructed supracardiac TAPVC and 2 obstructed infracardiac TAPVC). The primary sutureless technique is becoming a popular choice for repair of TAPVC, especially when they are obstructed. In this modified technique, the common chamber is opened last after most of the opened left atrium is sutured to posterior pericardium around the common chamber. This provides excellent visibility as surgeon is not hindered by the excessive pulmonary venous return once the common chamber is opened. Hence, moderate or severe hypothermia to go on low flows and decrease the high pulmonary venous return is avoided. Use of vent in the opened common chamber or posterior pericardium at high revolutions per minute is also avoided thus decreasing risk of hemolysis. This technique minimizes retraction and handling of the heart. Gentle retraction with a malleable retractor gives excellent view of the common chamber. Once the common chamber is opened, the anterior wall of the common chamber is excised which makes the common chamber wide open and prevents the free wall of the common chamber from falling over itself. This results in a nonturbulent flow from the pulmonary veins to the neo-left atrium. The incision is extended to the individual pulmonary veins if the sizes of the individual pulmonary veins are small or if there is ostial pulmonary vein stenosis. Low flows for a very short period can be used to confirm the adequacy of the incision to individual veins. In this technique, a right atrial incision is also limited just to check the interatrial septum and no retraction or incision of the interatrial septum is involved. The resultant overall atrial suture line will be least in this technique. In all patients with obstructed TAPVC, a 4 mm ASD is left behind to promote the right to left shunt across the ASD in the event of pulmonary artery hypertension crisis. This helps in maintaining adequate cardiac output at the cost of desaturation. The closed vein technique described by Hammel et al. requires incision of the interatrial septum, as the left atrium is sutured around the common chamber through the atrial septal defect except for the right lateral part. A similar concept was described recently by Alsoufi. Their technique differs from our technique in initiation of the left atrial incision and sequence of performing the anastomosis. 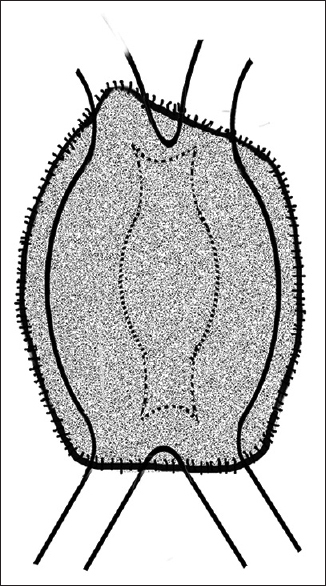 In their technique, the heart needs to be retracted, first to left and later in cephalad direction for completion of anastomosis. In both Hammel et al. 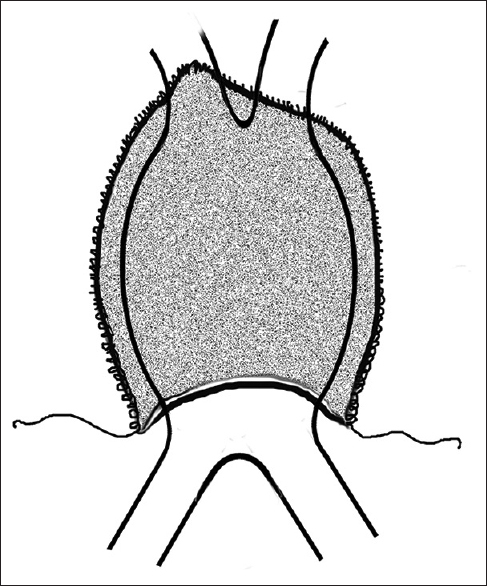 and Alsoufi's technique, the common chamber is opened through the incised interatrial septum which is then closed using an autologous pericardial patch. 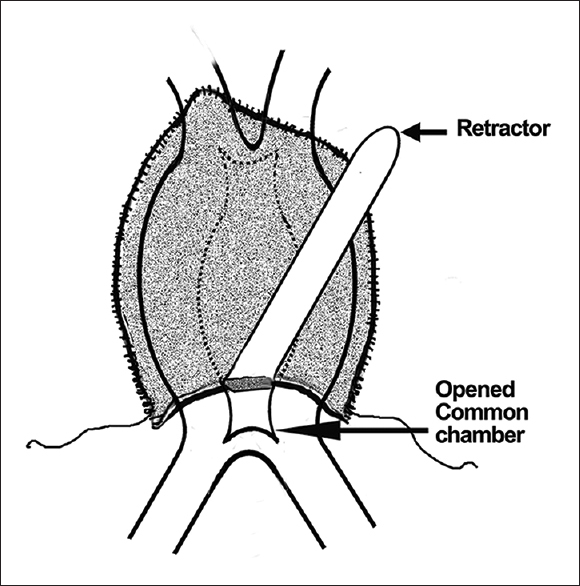 In our technique, as the common chamber is opened before completion of the anastomosis, it is not a closed vein technique  in true sense. Compared to unobstructed TAPVC, in obstructed TAPVC the pulmonary venous return is significantly higher. The use of this technique especially in obstructed small confluence and mixed TAPVC will make the procedure easier and convenient to do. This technique provides the patient with all the benefits of a sutureless anastomosis with decreased risk of long-term pulmonary vein stenosis, albeit care should be taken in not injuring the phrenic nerve. Najm HK, Caldarone CA, Smallhorn J, Coles JG. A sutureless technique for the relief of pulmonary vein stenosis with the use of in situ pericardium. J Thorac Cardiovasc Surg 1998;115:468-70. Yanagawa B, Alghamdi AA, Dragulescu A, Viola N, Al-Radi OO, Mertens LL, et al. Primary sutureless repair for simple total anomalous pulmonary venous connection: Midterm results in a single institution. J Thorac Cardiovasc Surg 2011;141:1346-54. Buitrago E, Panos AL, Ricci M. Primary repair of infracardiac total anomalous pulmonary venous connection using a modified sutureless technique. Ann Thorac Surg 2008;86:320-2. Hammel JM, Hunt PW, Abdullah I, Duncan KF. Closed-vein technique for primary sutureless repair of anomalous pulmonary venous connection. Ann Thorac Surg 2012;94:1021-2. Alsoufi B. Modified primary sutureless repair technique of total anomalous pulmonary venous connection. World J Pediatr Congenit Heart Surg 2014;5:302-5.